With two boys, one in Kindy and the other in Year 1, we’ve had a few boys’ birthday parties to go to already this year! So, I found a layout that I really like using and I’ve just varied it a little each time. 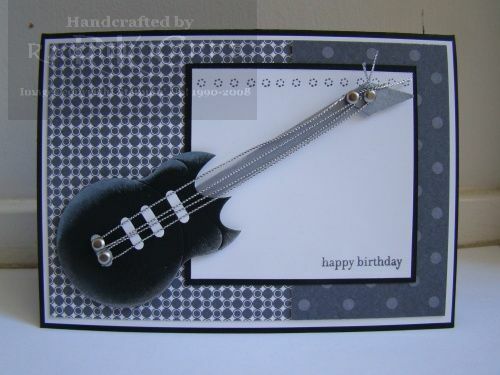 I have used the Grunge Rock and, sometimes, Extreme Elements stamp sets . I loved the colour combination of Crumb Cake, Basic Black, Tangerine Tango and Night of Navy. 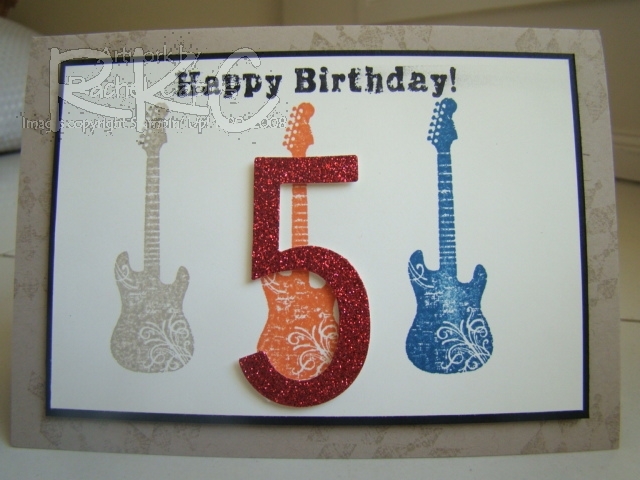 The next card I added the birthday boy’s age “5” by using the Big Shot and Simple Numbers Bigz Die and gorgeous red glitter paper. Such an easy card to make and so many variables! 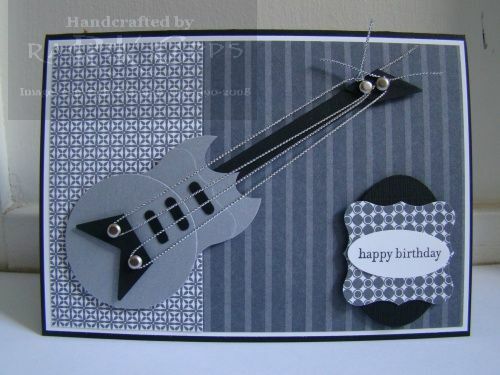 This is the birthday card I made for my brother’s birthday last year. 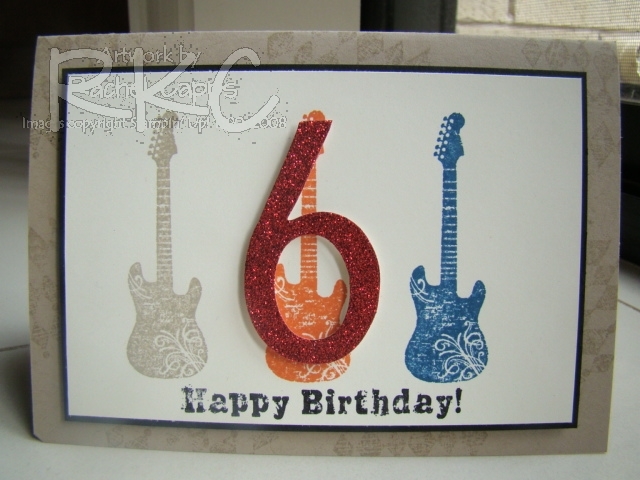 I just love the new stamp set in the Summer Mini – Grunge Rock – there just isn’t enough time in the day to play with it! I based the card around the colours Basic Black, Crumb Cake and Very Vanilla. 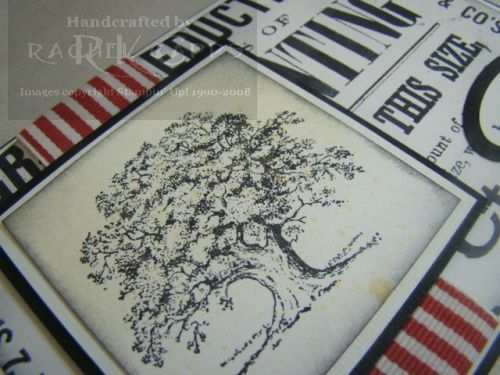 I used the Textured Impressions Embossing Folder, Square Lattice, through my Big Shot with some Very Vanilla cardstock. 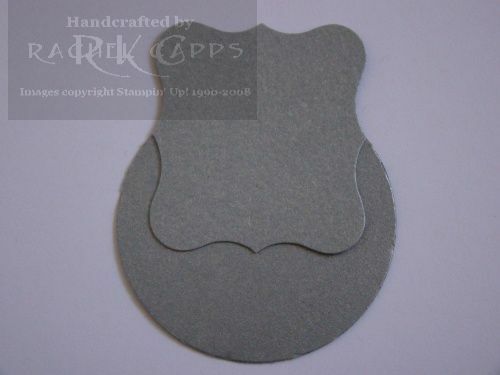 I stamped that embossed cardstock randomly with the diamonds from Grunge Rock. And then I used the new Gold Glow Smooch Spritz to finish off the background. 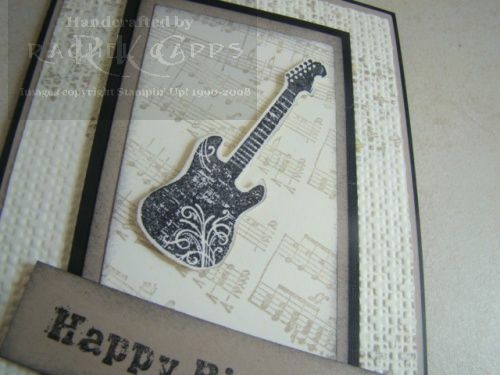 For the centre piece, I used the standard wheel, Music Notes stamped in Crumb Cake, and rolled in randomly across the Very Vanilla cardstock. 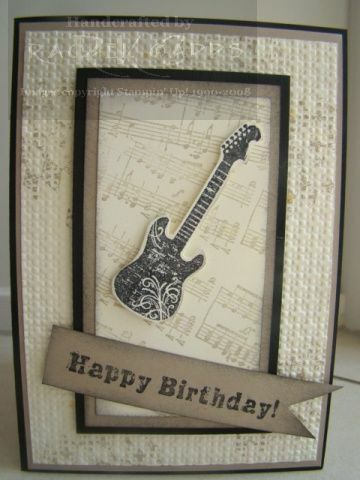 I stamped the guitar from Grunge Rock in Basic Black and cut it out. I stuck it on the Music Notes using dimensionals. 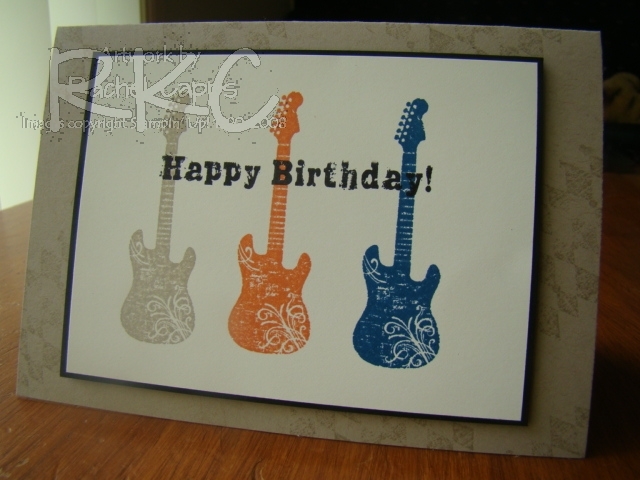 For the sentiment, it was stamped in Basic Black on Crumb Cake cardstock, and I sponged the edges in Basic Black ink. 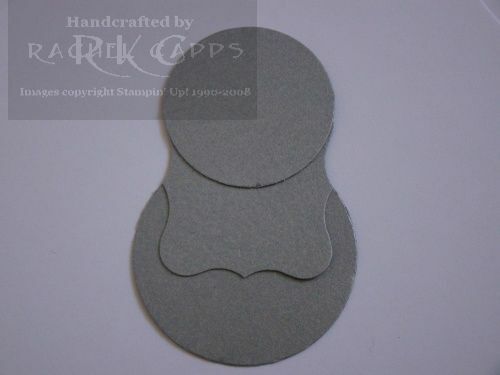 I was inspired by this lovely manly card here on Splitcoaststampers. Thanks mwben! So, for my card, I kept to the Newsprint DSP colours – Basic Black and Very Vanilla, except I brightened the card up a little with some Riding Hood Red Striped Grosgrain ribbon. 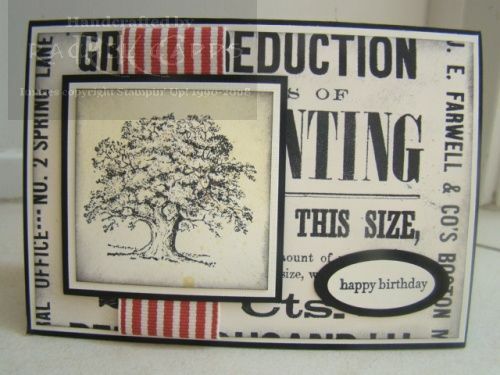 Then I sponged around the edges of the DSP and the stamped tree with Basic Black to add a vintage look. The sentiment came from the ever-handy Teeny Tiny Sentiments (a must-have stamp set). 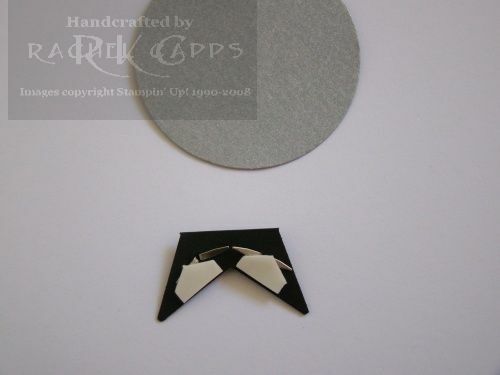 And this card took no more than 20 minutes to make – easy peasy! I made this card for my hopefully one-day-in-the-future brother-in-law. He’s a builder, so something with mechanical workings seemed a good choice – so I chose Sense of Time. The more I use this stamp set the more I love it! 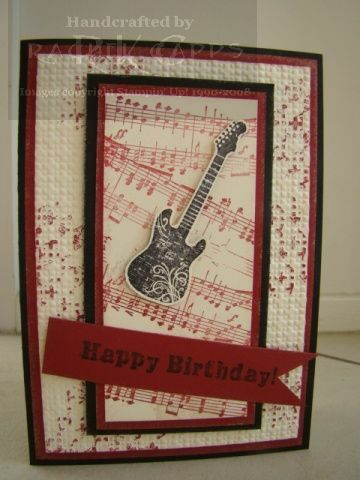 I think the colours Crumb Cake, Early Espresso and Very Vanilla make a great masculine card – what do you think? 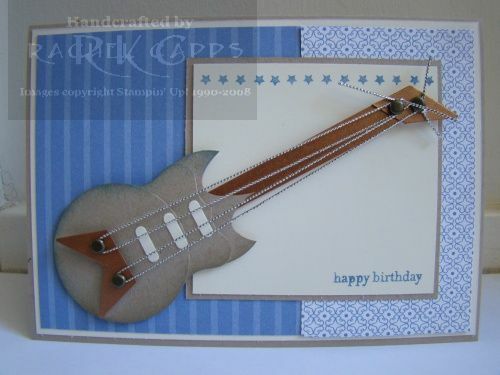 I haven’t added any accessories to the card but I have sponged all the edges in Crumb Cake. The sentiment is from Party This Way, which I stamped in Early Espresso on some Very Vanilla and then punched out with the Large Oval punch. 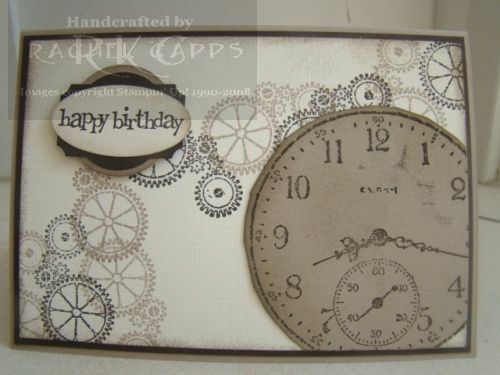 I then layered the sentiment with cardstock punched using my Designer Label punch and my 1 3/8″ Large Circle punch. 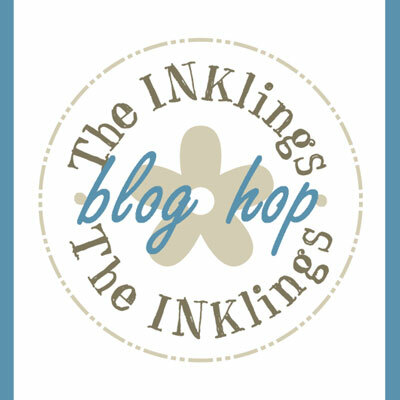 Welcome to The INKlings’ Team’s first ever blog hop. 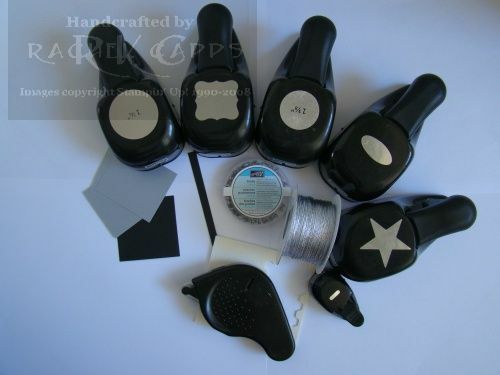 You may have arrived here from Rachel Jackson’s blog here or just be visiting my blog, whichever way, once you’ve checked out my cards and tutorial you can continue the hop through the link at the end of this post to the next team member. What style of cards do we frequently get asked for inspiration for? More often than not it’s masculine cards, be it little boys or grandfathers everyone seems to struggle with cards for the males in our lives. So as a team we thought we’d help you out by providing you with 20 team members’ fantastic blogs that you can hop through and get lots of fantastic ideas from. Want to win some Blog Candy? Simply leave a comment on each blog and then email Michelle Dyson here and let her know you’ve done so and you’ll be in the running for a fantastic prize of 20 handmade cards plus other goodies. Sorry Blog Candy prize not available to SU! demonstrators. 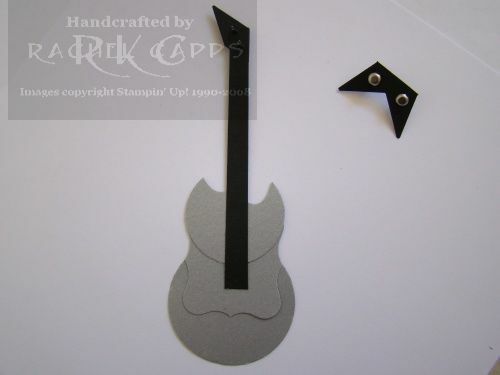 And if you’d like to create your own punch art electric guitar, here is a tutorial. 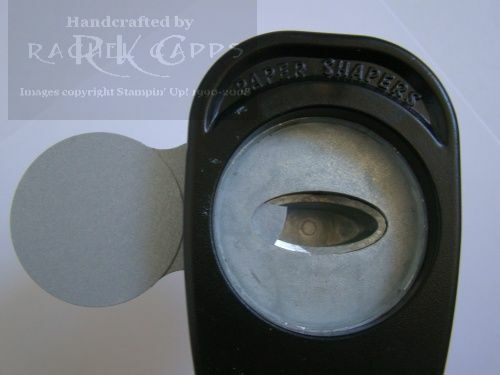 You’ll need these punches: Large Star, 1 3/4″ circle, Curvy Label, 1 3/8″ circle, Oval and Horizontal Slot. 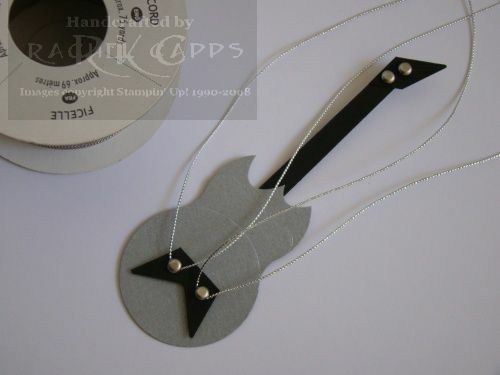 Plus you’ll need one piece of cardstock 0.7cm x 9.5cm for the neck, 2 pieces of cord 25cm long (I’ve used retired SU silver cord) for the strings and 4 brads for the tuners and bridge. You can see from the above photo, I used the cut piece of my Large Star to make the bridge. 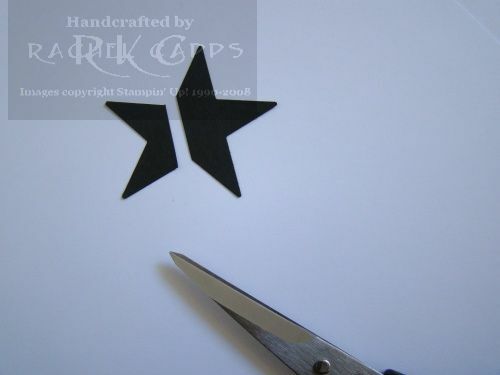 You can make it with a punched out piece from the Horizontal Slot punch, if you choose.I found it easier to use the cut out piece from the Large Star – the paper is stronger once you pierce it and stick your brads on. 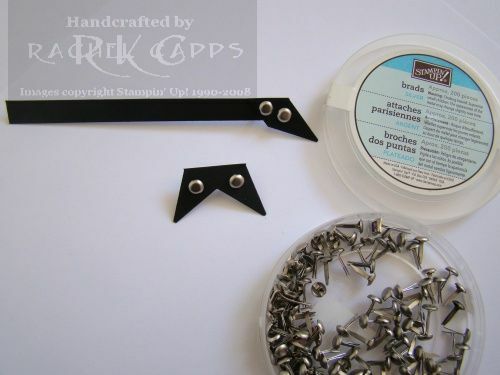 Then comes the fiddly bit! You need to wrap your cord around the brads on the bridge and tie the cord in a knot around the brads that are the tuners. 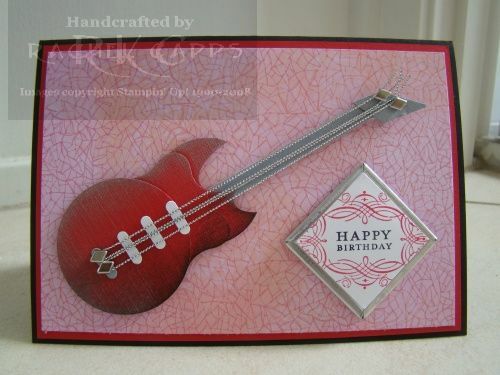 And then stick your guitar to your card! Well that’s all from me. Next stop on the INKlings’ Team Blog Hop is Carolyn Campbell-McLean here. Have fun and don’t forget to leave a comment on each blog to win some great Blog Candy. 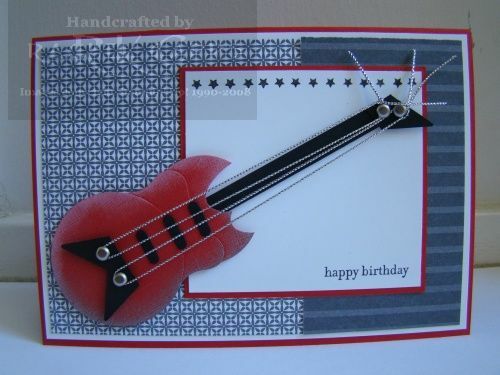 I was asked by a dear friend to make my God son’s birthday cards. He’s 16 this year (and making me feel very old! lol!). I sussed out his interests as we don’t see them as often as we would like – they live in Brisbane. Anyway, skakeboards and music were the clues. 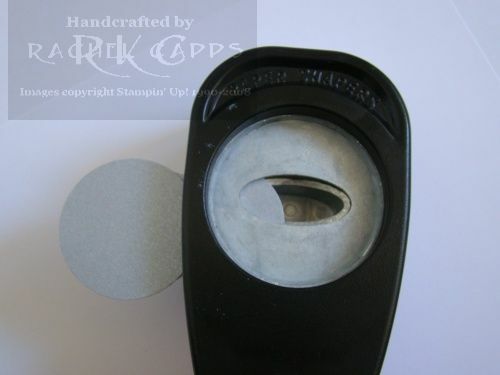 Only, I don’t have any stamps with music, guitars or skateboards! 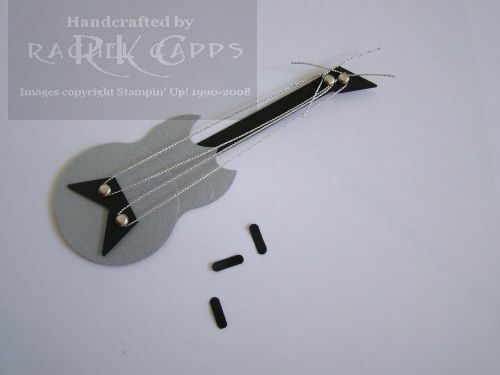 So this is what I came up with for the music card – a punch art electric guitar. I’m pretty happy with the way it turned out. I’ve used only Stampin’ Up! punches to make the guitar. 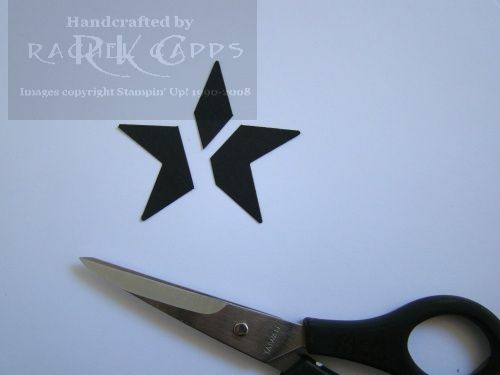 I used the 1-3/4″ circle, Curvy Label, 1-3/8″ circle, Small Oval, Horizontal Slot, and Large Star. 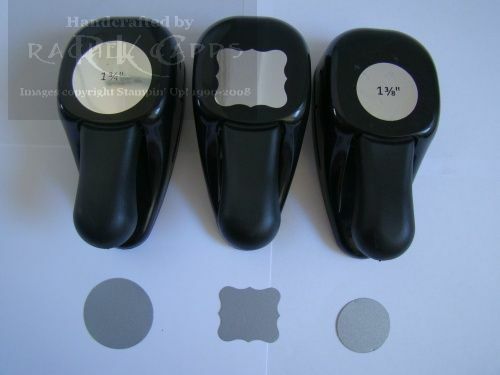 And I got to stamp a little – the sentiment. I used the Sale-a-bration stamp set, Vintage Labels. My favourite!! 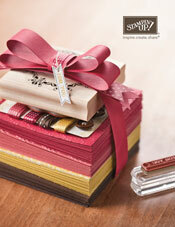 The paper is the Kaleidoscope DSP available in the current Stampin’ Up! mini. 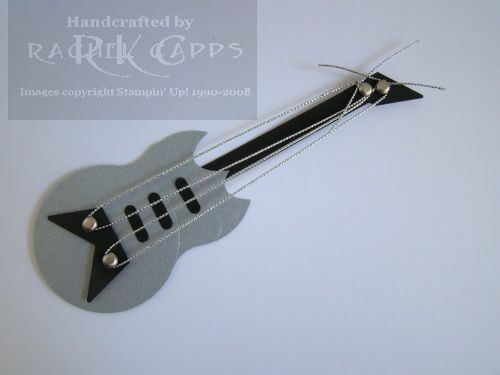 If you like my electric guitar, why not make your own and paste the link to your guitar in the comments section? I’d love to see what you come up with! If you’d like me to do a tutorial, let me know in the comments.